Her passion for nursing continued and in 1974 she graduated from Mack School of Nursing. Her clinical areas of practice were Burn Unit, Intensive Care, Regional Trauma Center and Emergency and Occupational Health Nursing. It was while working in the trauma unit at Hamilton General Hospital when her interest in furthering her education in Occupational Health and Safety came to her. Two workers came in from an industrial accident VSA (vital signs absent) and they could not be revived. She asked herself, how this of could happened, were there not health and safety regulations in the workplace to prevent such a senseless tragedy and then had to prepare herself for the families coming in to face this terrible loss, switching nursing hat from trying to save a life to one of providing comfort, compassion and support for the grieving families. She was at the time also working casually at John Deere as night shift nurse and this is where it all came together for her. In 2002 she attended Mohawk College and completed her Occupational Nursing Diploma and in 2008 completed her Canadian Nurses Association certification in Occupational Health Nursing with the main objective of improving health, safety and wellness in the workplace. She worked in various Occupational Health Settings in manufacturing, health care and Niagara Casinos. She built trust and a strong working relationship with managers, employees and union and was most effective in her disability management creating an early and safe return to work. She implemented health and wellness program in workplaces and blending mental and physical well being as she felt both were needed to have an employee present, motivated and productive in the workforce. She maintained confidentiality and was able to manage employee/employer boundary and in doing so management gave her full support trusting she was doing what was best for the employee. In 2008 while employed as Team leader/supervisor at Niagara Casinos she received a Gold Leadership Award in recognition of outstanding management and leadership behaviours for her effective communication, being approachable and knowledgeable, creating a vision and having others achieve it and a role model for company values. Noreen is currently employed as a part-time Registered Nurse at Brock University Student Health Wellness and Accessibility department providing first aid, physical and emotional support in a clinic setting to all students as they journey through academia ensuring they are successful and have the emotional and physical support to reach their goals. 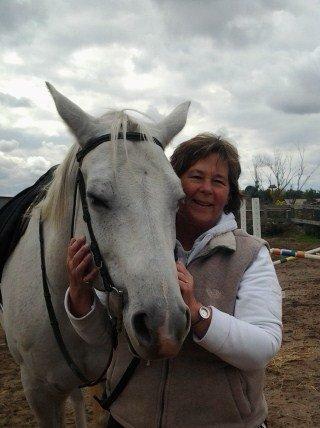 Noreen’s passion for horses continued and for the past 20 years she has ridden, owned, boarded and cared for horses at her small barn in Fenwick Ontario. She was always conscious of the powerful bond between human and horse, felt the connection and was always amazed at the comfort and peacefulness that would come whenever she with her horses. It was not until the loss of her daughter in 2017 that she experienced firsthand the healing power of the horse and wanted to learn more regarding this modality. A strong advocate in self-care, her grief from the tragic loss had left her spiritually and emotionally drained and when she was hospitalized for cardiac issues she knew something had to change/shift to regain her balance back. She registered for a two-day workshop/retreat at Horse Spirit Connection in Tottenham to reconnect with herself and what a better place than the countryside and horses. Her accommodation was a bedroom in the barn. From the moment she walked on the property and met Wendy Golding and Andre Leclipteux the owners of Spirit Connections she knew this is where she belonged as she felt an overwhelming sense of calmness and serenity and knew she landed in a soft, sacred place where self-reflection, growth and healing could take place. The magical work with the horses in self-reflection and heart connection over the two days brought so much insight of what had to change and what had to be let go. The healing recovery journey had begun. Experiencing the magical partnership through facilitated equine experiential learning she decided to pursue her certification as a FEEL practitioner, so she could take forward the healing and wisdom of the horse to others. She was certified as a FEEL practitioner in 2018. Noreen, mother, grandmother, and nurse combines her compassion, empathy and caring with her passion for horses. She provides and creates a safe space for anyone seeking growth, transformation, self-reflection and healing with her horses as guide and teachers. Explore the possibilities of human/horse connection and regain balance in your life.